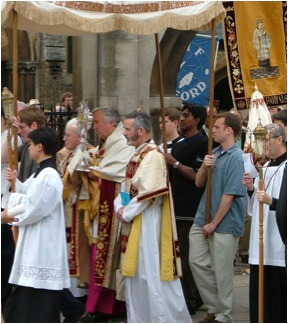 The annual Deanery Corpus Christi Procession takes place this coming Sunday, and this year will be led by Bishop Robert Byrne, Cong. Orat. The procession leaves from our church at 2.30pm, stops at Blackfriars for a sermon by Fr Robert Ombres, O.P., and concludes with Benediction at the University Chaplaincy. Particpants are warmly invited to wear uniforms, academic dress, first Communion outfits, etc.